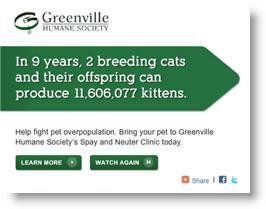 Have you seen the Greenville Humane Society’s new website? If not, it's likely that a dozen friends will share the link with you before this week is over. As a case study in how nonprofits can use "viral" content — to gain attention, to promote a cause, and to call for action — SpaysNotStrays.org is a winner. SpaysNotStrays.org is a terrific flash-based PSA, in which a pleasantly conventional nonprofit website (that happens to advocate for pet population control, quite effectively, even before the animation starts) is gradually overrun and wrecked by a host of playful cats and kittens. Cats: It has cats! And if we’ve learned anything from the wild success of LOLcats, CuteOverload, and the like, it's that the Internet can't resist cute animals — especially if they’re funny, and especially when they’re getting the better of humans. Animation: Even the most web-savvy of audiences are still not entirely jaded by the clever use of technology, somehow — and Hollywood knows, we do so love to watch those moving pictures! Sharing: Content can’t “go viral” if it’s a hassle for people to share. This campaign has three easy social-sharing options: share by email, share on Twitter — check out the hashtag #SpaysNotStrays — or share on Facebook. Note, too, that the Twitter and email messages are pre-populated with text so users don’t have to think about what to write (although of course they can change the words if they’re so inclined) and the Greenville Humane Society gets yet another chance to hammer home its message. Call to Action: When the animation ends, you’ve got two main choices (besides sharing it with friends): “Watch Again” (and who wouldn’t want to?) or “Learn More”. Human nature dictates that, since the first screen was so entertaining, a good proportion of viewers will click through on that second link to the humane society’s main website. There, visitors get a very specific call to action, along with all of the practical information they’ll need to follow through… IF they’re located in Greenville, South Carolina. As an animal lover in an entirely different location, I’d like to see this campaign reach out beyond the local Greenville area — beyond supporting the mission of this specific organization to promotion of the underlying cause. How? Maybe a link to a directory of clinics for those who aren’t in the targetted geographic area is all that it would take? Because this is a local group, I see no great risk of splitting off the audience when it comes to taking real-world action. In fact, a happy collaboration will tend to build credibility for all of the partners. And obviously, the visually impaired are excluded from the fun whenever content is presented in a visual medium only. I wonder, thinking here of how radio programs are able to create powerful mental images with soundscapes alone, could a similar concept be done with audio? It would be great to hear how a creative ad agency might handle that challenge! 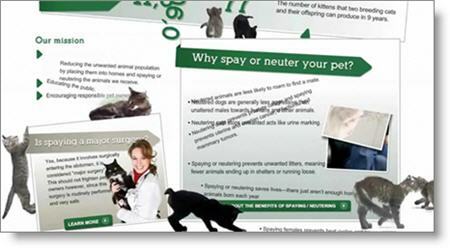 As made-to-go-viral campaigns go, all told, SpaysNotStrays.org stands out as a simple yet brilliant idea, well conceived and well executed. Take a few minutes to visit the kittens, and see what ideas come to mind for promoting your own organization’s projects online. How might your non-profit’s key message be delivered in various media, for different audiences, in ways that people will want to spread around to friends? As always, please feel free to share in the comments. * Thanks to Joe Flowers (@unhatched) for the tip on AdWeek’s blog post: Spay the Cats Before They Ruin Your Web Site. In the scheme of things, animal welfare organizations receive a very, very tiny proportion of funding from other than individuals. So, I'm curious what the nifty website cost the Humane Society, and how they're measuring impact on the community.